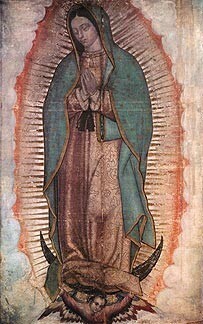 Today December 12th is the feastday of Our Lady of Guadalupe. 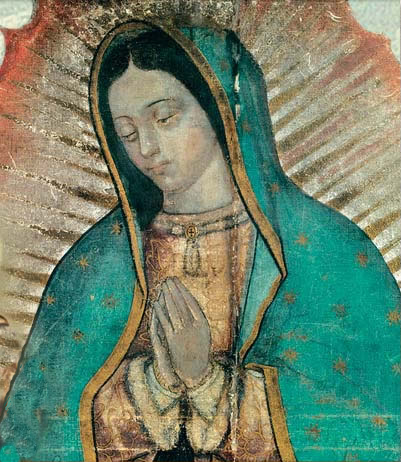 It is not surprising that her feastday comes in this time of Advent because Our Lady of Guadalupe is truly the perfect Advent image. We know she was with child in this image because she wears a black belt which was the Aztec Maternity Belt. On January 23, 1999 in a homily at the Shrine of Our Lady of Guadalupe John Paul II called the “Basilica of Guadalupe, the Marian heart of America”. “The Apostle Paul teaches us that in the fullness of time God sent his Son, born of a woman, to redeem us from sin and to make us his sons and daughters. Accordingly, we are no longer servants but children and heirs of God (cf. Gal 4:4-7). Therefore, the Church must proclaim the Gospel of life and speak out with prophetic force against the culture of death. May the Continent of Hope also be the Continent of Life! This is our cry: life with dignity for all! For all who have been conceived in their mother’s womb, for street children, for Guadalupe! To you we present this countless multitude of the faithful praying to God in America. You who have penetrated their hearts, visit and comfort the homes, parishes and Dioceses of the whole continent. Grant that Christian families may exemplarily raise their children in the Church’s faith and in love of the Gospel, so that they will be the seed of apostolic vocations. Turn your gaze today upon young people and encourage them to walk with Jesus Christ. JUST 13 MORE PRAYING DAYS ‘TIL CHRIST’S BIRTH!